Active Wow Charcoal Teeth Whitening Powder: Is It A Scam? 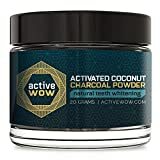 Active Wow Teeth Whitening Charcoal Powder is a #1 Best Selling Product on Amazon that gives peroxide-free teeth-whitening results (view on Amazon). But can charcoal really get results or is it just a scam? Whiter teeth have certainly never been more sought-after than today. Whether it’s to boost your self-confidence or increase your chances during a job interview, whiter teeth are a great way of improving yourself on the outside and the inside. Because teeth-whitening products are so popular, there are many different products on the market. Therefore when considering an all-natural product, it’s important to find one that is effective. Most products rely on peroxide, a kind of bleach. This gives results, but also risks causing sensitivity. Natural products typically minimise these risks, but as a result may also be less effective. In this article, you can find a short summary of the Active Wow Teeth Whitening Charcoal Powder, a product containing only natural ingredients. Contains no peroxide – this chemical, a kind of bleach, can cause teeth and gum sensitivity. Long lasting- each jar can last 2-3 months. Doesn’t guarantee definite results: the website says that results may “vary from person to person”. Slow results- results are described as occurring “over time”, without any fixed time frames. Although this product certainly avoids using harsh chemicals, it also doesn’t have any information on the quality or speed of results. This is often the case with natural products as they have less regulation and testing than chemical products.The addition of multiple flavors might attract some customers, but the lack of guarantee should be considered. That said, Active Wow Teeth Whitening Charcoal Powder is the most highly rated teeth whitening product available on Amazon. 1.) Does Active Wow Teeth Whitening Charcoal Powder Work? Activated charcoal is famous for its whitening and detoxifying properties. Carbon based products like coconut, wood, or other substances are heated to very high temperatures, and combine with gas to increase its surface area. This process makes the charcoal porous (like a sponge) and gives it a negative charge. Because of this, it can draw positively charged toxins out (like a magnet) which then get trapped in the sponge-like structure of the charcoal. Medically, it is often used to absorb poison or toxins from the body. The product works by applying the powder before brushing your teeth. Simply dip your toothbrush in the powder, and then brush your teeth as normal. The activated charcoal will work on your teeth while you brush, and restore the natural whiteness of your tooth rather than bleaching it. Finally, after you have finished, rinse your mouth thoroughly with water. Then continue your normal brushing routine. The powder is easy and safe to use, as the all natural ingredients will not irritate your mouth (see details). 2.) Is Active Wow Teeth Whitening Charcoal Powder Safe? The short answer is yes! The ingredients are all natural and non-toxic, and the application is straightforward. Furthermore, activated charcoal powders scores low on Relative Dentin Abrasivity Scale- typically between 70 and 90. Any score below 200 is considered safe for your enamel. Dentists still recommend brushing gently to minimise irritation to the gums. If you are still concerned, consider letting the powder sit of your teeth rather than brushing it in. As with many natural products, there really isn’t much information about this. The website describes the effects as happening “over time”. One Amazon reviewer reported a noticeable difference after two weeks of use. Because the ingredients are so gentle, they may not cause immediate results. You may want to factor this in when considering purchasing this product. Be sure to follow the instructions below for the best results. Rinse mouth thoroughly to remove the charcoal. Spit directly into the drain while the tap is on to keep the sink clean. This product can be used twice daily, with no given limit on treatment length. Be sure to follow directions given by the packaging, and always consult with you dentist if you are unsure. This depends on how well you look after your teeth. It is certainly a good idea to avoid cigarettes and staining foods for better results. Staining foods include coffee, red wine, soy sauce and cola drinks. Using a whitening toothpaste will support the Active Wow Teeth Whitening Charcoal Powder, as will regular trips to the dentist and generally good dental hygiene. There are definitely stronger products on the market and Active Wow Charcoal Whitening Powder only has anecdotal evidence regarding the extent of its results.. Products containing bleach will work more quickly and effectively, but they risk causing tooth sensitivity. However, there are also other products designed for sensitive teeth that contain low levels of peroxide, such as Crest Gentle Routine Whitestrips. If you don’t mind using non-natural ingredients, these may work better for you due to the peroxide included. The product may be bought in several flavours: Natural, Vanilla, Spearmint, Peppermint and Orange & Cinnamon (see range of flavors). Organic Coconut Powder Activated Charcoal- to whiten and purify. Orange Seed Oil- natural whitening and anti-inflammatory properties. Active Wow Teeth Whitening Charcoal Powder is an all-natural product, therefore it is very unlikely to cause gum or teeth sensitivity. However, there seems to be no concrete information on how well, or how quickly, this product will work. If you want faster results, it may be worth considering other products due to their stronger ingredients. That said, it is the number one best selling teeth whitening product on Amazon and it is excellent for those who have sensitive teeth, or for those who want all-natural ingredients. Will this work on veneers? This product will only be effective on natural teeth. If you wish to find a solution for veneers, consult with you dentist. Do you have to use this with a normal toothbrush? I have an electric. You can use this product with both a normal and electric toothbrush. How long does the jar last? The jar should last for 2-3 months, provided you use it as described above. Can I use this instead of toothpaste? This product is designed to be used alongside your normal toothpaste. It is recommended that you brush with toothpaste twice a day. While the product itself is not approved, the individual ingredients are. If you have any doubts, be sure to ask your dentist. Is this ok to use if you have crowns? While the product will not whiten the crowns, it won’t cause any damage either. The natural ingredients are very gentle. How fast do you start noticing changes to your teeth? Results will vary from person to person, but some customers report results in as little as a few days. Does it strengthen your teeth? Does it take enamel off your teeth? Is this abrasive/gritty at all? The activated charcoal may be a little gritty, but not uncomfortably so. Dentists use a scale called Relative Dentin Abrasivity to measure abrasiveness. Anything below 200 is considered safe, with lower scores being safer. Charcoal powders typically have a score of 70-90 compared to whitening toothpastes at 140+. However, if you feel it is causing discomfort, consult with your dentist. If I stop using it will my teeth go back the same color? This depends on how many staining foods such as coffee or red wine you consume. It also depends on your dental hygiene in general. After you stop using the product, you may notice some darkening of your teeth. If you wish to continue whitening, simply restart using the product. Are results permanent or will you have to use the product forever to maintain whiter teeth? Stopping the product won’t harm your teeth, but you may notice that they become less white. For best results, use the powder regularly and continuously. Is this product vegan/ cruelty free? All ingredients are natural, vegan, and cruelty free. Can I still use this product even though I have braces? It’s advised to wait until your braces are removed to use any whitening products. If not, you may experience very uneven results. Does it make your teeth sensitive? None of the ingredients should irritate your mouth. If you do experience any sensitivity, be sure to contact your dentist. Philips Zoom Whitening Pen: Too Good To Be True?